It is trite that voters will turn out in large numbers to vote in an election if the following factors suffice: the voting process is simple and understandable; the voting area (polling unit/voting point) is accessible; they trust their votes will count and will not be stolen; they can vote in a safe and secure environment; there is a trusted candidate/party on the ballot and they are passionate to vote to office, among others. As noted earlier, the commitment of Nigerians to the democratic process is never in doubt. This point was harped by John Campbell during his guest appearance at the PUNCH Forum organised by this newspaper last year and also corroborated by the United States in its statement on the elections on Thursday even though it expressed deep disappointment at the “quality” of the 2019 elections headlined by “vote-buying, low voter turnout, voter suppression, violence in some locations and interference by security agencies.” This commitment was evidenced in the enormous challenges voters had to endure in order to take part in the voting. 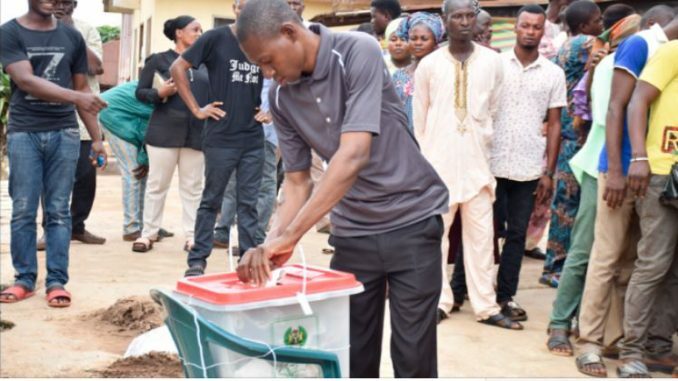 One of the iconic photos that emerged from the elections was that of an infirmed old woman being carried on the back of a young man to be helped to cast her ballot at a polling booth in Lagos. Sadly, such determination and commitment to the process is not rewarded with the much talked about “dividend of democracy” and better life. This is what played out in Lagos during the governorship election. The violent incidents of voter suppression in some parts of the state during the presidential election forced many voters to stay away from the election venues especially in areas like Okota, Ago, Aguda etc where thugs chased away voters and destroyed voting materials in broad daylight. Polling unit after polling unit, voters were conspicuous by their absence. The result is that the total number of accredited voters during the presidential election was higher than the turnout in the governorship election by 190, 416! At several units where I visited, many told me they were not ready to waste their time in voting alleging that the winners had already been pre-determined. When voters do not have confidence in the integrity of the electoral process, what follows is voter apathy. The militarisation of the elections also accounted for the huge voter apathy recorded. The 2019 elections were arguably the most militarised and yet the most violent in Nigeria’s electoral history. Media reports quoted the Nigeria Civil Society Situation Room, headed by Mr. Clement Nwankwo, as saying no fewer than 58 Nigerians were reportedly killed during the elections, with Rivers State alone accounting for 30 of this alarming number. The President faced wide criticism, on the eve of the elections, for ordering the military to “ruthlessly deal” with ballot box snatchers. The Army high command had earlier assured Nigerians that the military would only “provide” security and not interfere in the process. It is going to be an endless debate on what the role of the military will be in the electoral process in Nigeria. But it goes without saying a neutral military in a political contestation is an imperative for democratic consolidation in Nigeria. Be that as it may, as Dayo Olaide observed, under the current INEC elections guidelines, voting is for a maximum of 10 hours; beginning at 8am to 2pm (under Rule 10(c)), and up to 6pm (when the no-movement rule on Election Day shall be lifted) for voters who are confirmed to have joined the voting line (queue) before 2pm. A breakdown of the 10 hours for a maximum of 500 voters per polling unit suggests an average voting time of 72 seconds (i.e. 1 minute, 12 seconds) i.e. 10 hours multiplied by 60 minutes, which equals to 600 minutes. Dividing 600 minutes by 500 voters gives 72 seconds per voter. This, Olaide claims, is highly unlikely given the current chain of events a voter must pass through. Instructively, voting and accreditation are about 16 steps going by INEC’s Rule 10(d), (e), (f) and 11 (a) to (f). It is thus quite impracticable to complete the steps in the 72 seconds allotted under the INEC rule. In fact, a sample of voters interviewed during the presidential election in Lagos suggested an average of three minutes, a minimum, is required for one voter to complete the exercise. This means that a total of at least 25 hours is necessary to a) read the PVCs, b) authenticate finger print of voters using the smart card reader, c) check the register of the voters and d) ink the cuticle of 500 voters in a polling unit. Compared to 10 hours allowed under the INEC rule, it means a lot of voters stand the risk of being disenfranchised; should they decide not to wait for as long as is necessary to cast their ballot! This type of long waiting to be served, analysts say, is enough to discourage voters who may decide to stay away. A voter in Ajao Estate, Lagos enthused during a conversation that he was not prepared for that tedious wait. Therefore, for the 2023 elections, it is recommended that INEC would have to revisit the current ceiling on the number of voters per polling unit and/or voting point (500 voters). Working on the current 10 hours available in its guidelines, the commission may have to consider a maximum of 300 voters per Polling Unit to give more time to voters to complete the voting exercise. This however has a huge cost implication; in terms of additional number of polling personnel, polling kiosks, inkpads, security personnel, etc that would arise from creating additional polling units and voting points. One of the most evident implications of the electorate voting with their feet, choosing to remain at home instead of being at the polling units to vote is that the outcome of such an exercise will not enjoy wide acceptability and political legitimacy. Hence, it is impossible to have a legitimate government that is respected home and abroad when a majority of the voters are either deliberately suppressed or stay away, of their own choice. An illegitimate government cannot be accountable and is a major threat to democracy, in the medium to long term. It is worth noting that voter turnout in Nigeria has continued to drop since 2007; from over 50% to about 35% in 2019. In particular, Olaide contends that unless INEC is able to quickly address public confidence in the commission, promote accountability in the role and conduct of security agencies, and improve collation which has remained the BIG elephant in the room, there is a higher possibility that voter turnout in 2023 and beyond may dip even further. This may likely continue until we get to a point where public trust in democracy begins to wane and Nigerians begin to canvass “alternatives”. This is a dangerous trend that must worry every keen observer and lover of democracy. It is important that INEC is encouraged to regularly provide the public with detailed analysis of wastage associated with voter apathy to help election planning and management in our country. For instance, if the commission makes available the economic waste encountered by virtue of 64 per cent of the voters staying away from the 2019 elections, the electorate could be better informed that their indifference is an act of economic waste and sabotage to the nation. On the issue of insecurity, government is reminded of its statutory obligation to ensure security of lives and property before, during and after elections. Sustained security during elections would go a long way in incentivising voting and boosting citizen participation in the democratic process.